The church was built as a chapel of ease in the parish of Broadwater and building started in 1841 (ICBS). 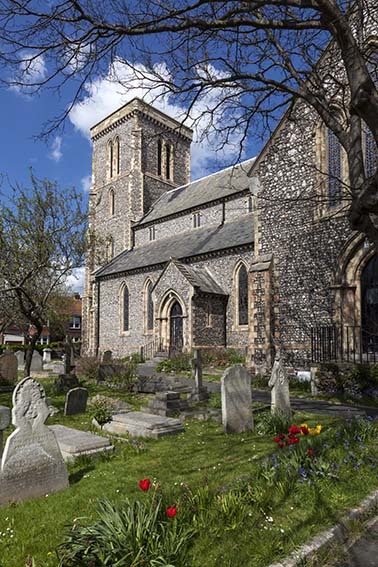 It was competed in 1845 and became the church of a separate parish in 1855. Although St Paul’s was older, this has been regarded as the parish church of Worthing since 1865 (Elleray: Worthing, caption of plate 144). le reconstruction and cannot have been carried out entirely, for the church remains typical for its date with many features that could not have pleased the Ecclesiologists, though they would have been widely acceptable in a Low Church stronghold like Worthing at this date. The church is built of galletted flint on a cruciform plan with short, lower transepts. 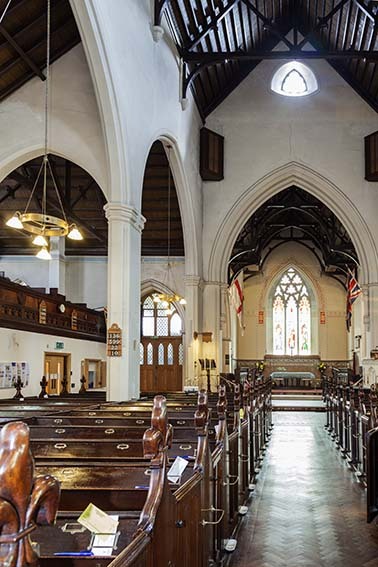 It appears to have been built to house as many worshippers as possible in the available space with closely packed pews, though the cost came to over £6000 (PP 125). The pews, though low, have doors, which were a further dislike of the Ecclesiologists. The chancel roof has thin hammerbeams and the less elaborate timbers of the nave are equally thin. The arcades are broad and aside from their moulded heads do have stone piers, as had been demanded by the Ecclesiologists. Both the east window and the west one in the tower are traceried and from their style they could be later insertions. However, the presence of glass of 1850 in the east one (see below) shows that this is not so. Like the aisles, the tower has lancets, but the flat top and projecting parapet are a good indication of its date, as was the installation originally of a west gallery. By 1875 £1000 had been spent on restoration (ibid), most obviously the addition of galleries in the transepts in 1865 (VCH 6(1) p121); the south one now houses the organ. The suggestion that the transepts themselves date from then (GRI) is wrong. The addition of galleries at so late a date confirms the evangelical leanings of the parish. There was more work in 1876, when the west gallery was enlarged and the walls painted with masonry lines and stencilled biblical texts, as befitted an evangelical church. This decoration is to be seen on a photograph of the 1940s or early 1950s (Elleray plate 198), but only that on the east wall of the chancel survived a redecoration in 1954. 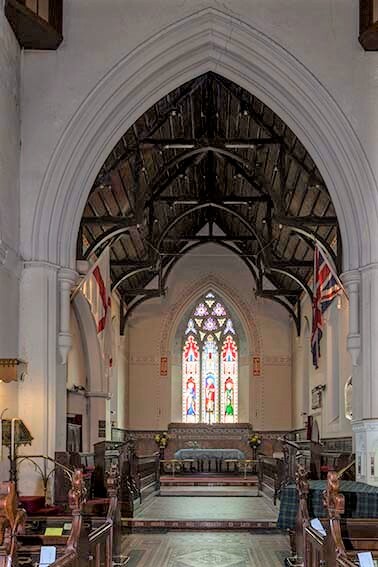 In 1893-94 R S Hyde (CDG 7 p113) removed the west gallery, added an organ chamber and re-ordered the chancel, inserting a shafted chancel arch, of which the head is more heavily moulded that those of the arcades. The total cost of the work in 1876 and under Hyde is said to have been £2700 (KD 1899). The same architect underpinned the tower in 1907-08 (EH). Today the interior is mostly painted white and the east end has lost Hyde’s reredos, carved by H Hems (B 69 p342). As the church is situated close to the centre of Worthing, the population and thus the congregation has declined so in 2008 redundancy was under active consideration, but was deferred following vigorous protests, Since then the parish has shown signs of growth, particularly following the addition of the former parish of Holy Trinity in 2014. There has also been recent work in the north transept to add a kitchen and toilets. Font: Small octagonal bowl with trefoils on the side. 1. (East window) J Bell and Son of Bristol, 1850 at a cost of £144 (JSG 22 p44). 2. (South chancel, second window) Ward and Hughes, c1877 (signed). 3. (South transept, first east window) Cox and Sons, 1859 (ibid). 4. (North aisle, first window) Heaton, Butler and Bayne, c1889 (ibid). Pulpit: Stone, with traceried sides and marble shafting, Jones and Willis, 1894 (EH). 2. My thanks to Bob Cutts for clarifying Elliott’s position during the period of construction.